This is the easiest testimonial I can write. Since switching our car to Renewable Lubricant bio-based products, we have seen an increase in engine parts life – bearings, lash caps, rocker arms. We have seen an increase in parts life by an amazing 300%. Our engine bearings – by far the most abused parts – last race after race. Our rear-end gears – same story. Our 3-speed Lenco transmission looks so good that Lenco technician, Matt Moore, says he would like to recommend all racers use Renewable Lubricant’s transmission oil. We won our 7th World Championship totally lubricated with Renewable Lubricants. 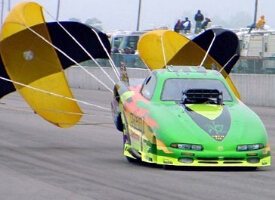 In 2000, we set a new world record in Rockingham, NC at 241.77 MPH. Besides the performance end, it is very, very safe to use. The flash point of Renewable Lubricant’s oil is much higher than that of petroleum based oils. This gives me much peace of mind in the event of a crash or a broken oil line. 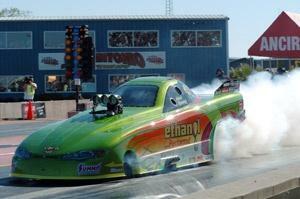 We, here at Mark Thomas Racing, can claim the winningest record in IHRA history. A lot of our accomplishments could not be possible without the reliability of Renewable Lubricants. I could race without Renewable Lubricants, but certainly do not want to.